Ben Young’s Hounds Of Love bears a striking similarity to an actual murder case that took place in Perth, Western Australia, in 1986. A local couple, David and Catherine Birnie, abducted, held captive and subsequently murdered a number of young women for their depraved sexual gratification. The story has been reworked for this tense interpretation of a real-life event in one of the most isolated cities on Earth, one with a rather dark history of serial killers. Young opens his film with visual scenes of 'two stops over-exposed' summer banality as his camera moves in slow-motion down a suburban street where people are washing their cars as they water their parched lawns, simultaneously hosing down their kids who are looking for some relief from the harsh light and the unrelenting heat. The houses are all nondescript bungalows built in insipid tones of salmon pink brick, with low roofs and little ventilation. This is a canny move because it establishes the claustrophobic atmosphere awaiting his audience. One evening, a teenage girl, Vicki Maloney (Ashleigh Cummings), climbs out of her bedroom window and heads off to meet up with friends following an altercation with her mother Maggie (Susie Porter) after she was grounded. An innocuous couple, Evelyn and John White (Emma Booth and Stephen Curry), curb-crawl alongside Vicki as she heads off to her destination and offers her a lift and, enticingly, a ‘smoke’. Vicki agrees because of the presence of another woman (what can go wrong, right?) and ends up back at their place. This is where the manipulation and degradation commences. The rest of the film is a dark ride into the abyss that makes up the couple’s relationship. Evelyn is in thrall of control freak John and Vicki has to find a way to bring her on side to make her escape. ​Utilising a tight, spare script brought to life by excellent performances from the principal actors, especially Booth's, Young’s directorial début reveals a gut-wrenching sequence of events that creates a taut psychological drama. 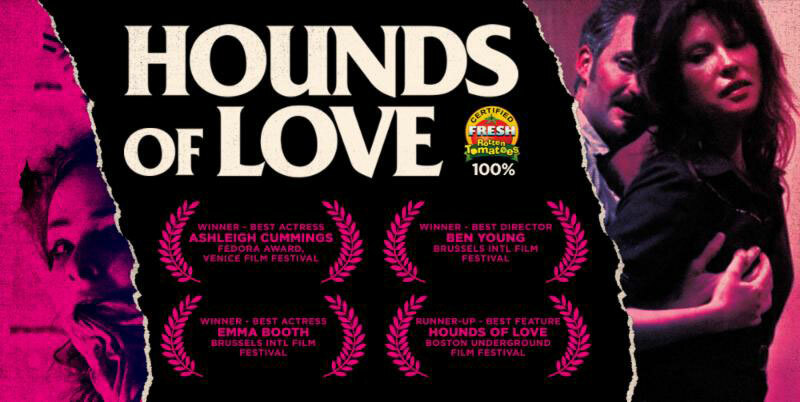 Hounds Of Love will make you think twice about any desire to visit the West, in much the same way that Wolf Creek made us think about the Territory and Ivan Milat about New South Wales. It will definitely serve as a cautionary tale to those tempted to judge a book by its cover: never accept a lift from strangers, even if they look harmless!